Today FlexJobs released new insights from its August 2018 survey, which gathered responses from over 3,000 workers about key topics related to career, work flexibility, and workplace issues. 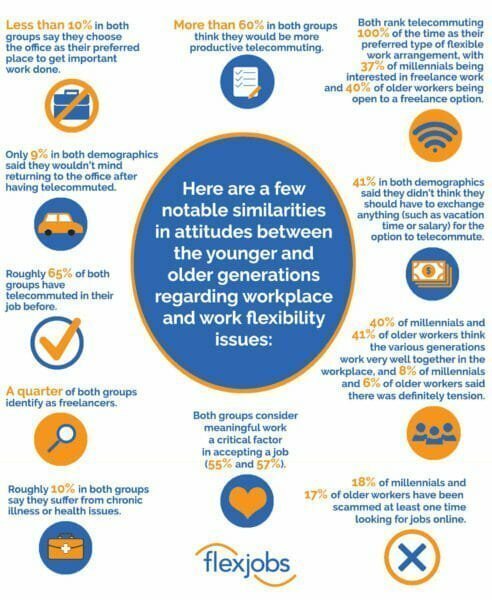 FlexJobs specifically analyzed and compared responses from members of the millennial generation with those who identified with the baby boomer or silent generation to uncover differences and similarities in workplace attitudes and behaviors and find out why work flexibility matters to them. “Although the generations are interested in work flexibility for different reasons, one thing is clear: they all place a high value on work flexibility, with particular emphasis on telecommuting options,” said Sara Sutton, founder, and CEO of FlexJobs. “Another point that their responses made overwhelmingly evident is that working within the confines of a traditional office environment is not conducive to producing most employees’ best work. When people of all ages think they would be more productive working from home, employers really need to re-examine their antiquated notion that working 9-to-5 in an office is the best way to maximize results from their employees,” Sutton concluded. higher rates than millennials did (11% and 10%). Older workers also identify working in the education category (21%) more so than millennials (14%). One of the big takeaways from this data is that work flexibility is a big deal. More than anything, professionals across all generations think they would be more productive telecommuting and rank remote work as their preferred type of flexibility. Unfortunately, there are a lot of perceptions of what work-from-home jobs and other flexible jobs can be, most of which are outdated. 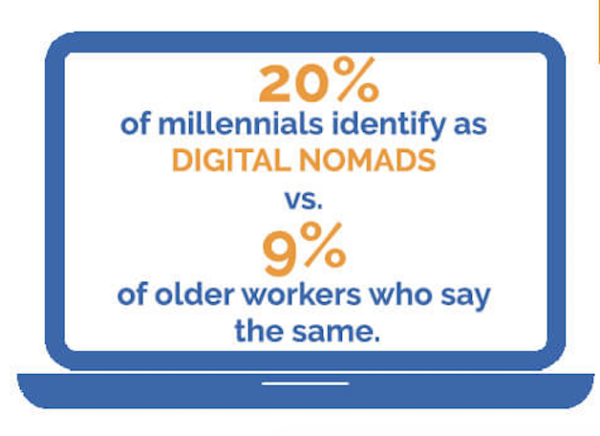 To help showcase that remote jobs offer far more viable professional options than most people tend to realize, FlexJobs has also highlighted a sample of remote jobs for all generations to consider below. Be responsible for integrating and analyzing genomic data obtained from bacterial isolates and develop analytic methods to integrate output. Option for a remote job with travel required to conferences and meetings. Remote-based position. Provide telepsychiatry services in an outpatient community, develop subject expertise, and provide required equipment. Must have one year of psychiatry experience. Manage clinical studies, lead teams, ensure study goals are met and compliance is achieved. Vendor and budget management experience required. Must have a degree in nursing or life science and strong clinical research experience. Contract position. Option for telecommuting. Candidate will execute concepts & guidelines in various creative projects, track results of team efforts, and suggest actions and changes for the future. Must have 3+ years’ experience as a creative director. Provide legal advice and support to business leaders, support regulatory affairs, and draft and negotiate contracts. Must have a JD and a law license, along with 1+ years of regulatory or transactional experience. Telecommute position. Be responsible for virtually meeting with families by video conferencing and phone to conduct recruiting assessments with NCSA members of college athletic recruiting. 5+ years of experience in sales is needed. Work remotely. A regional medical director is needed for a remote role. He/she is responsible for guiding the medical direction of both GP and specialty hospitals. Must have a desire to continuously improve the quality of medical care delivered. Prior related experience required. Seeking an ESL teacher or tutor to provide services for students in a virtual environment. Must have a college degree and access to a personal computer with internet access. Prior teaching experience is helpful. Remote. Join a team and create sale channel partnerships and lead and develop processes for partnership sales located throughout the Bay area and reach out to vet prospects by email, phone, and in-person. Work remotely from home. Duties include developing a leading outdoor route planning and navigation platform, running tests, gathering user feedback, and optimizing features. Full-time position with some remote work. Duties include building relationships and educating veterinary and pet retail customers, delivering internal education to sales territory managers, and supporting customer initiatives. DVM or VMD required. Lead projects, mentor staff, and produce scientific presentations and technical reports/manuscripts. Must have a master’s degree and 12 years of postdoctoral experience. Full-time, remote position with moderate travel. Will prepare and review S corp, LLC, and individual tax returns; identify and research tax planning and compliance issues, and provide tax consulting. 4+ years of experience required. Partial remote options with a flexible schedule. Works in a remote fast-paced environment analyzing intrusions and detections, improving detection capability and efficiency, and assessing cyber threat intelligence. Must be knowledgeable of programming languages. Prior related experience required. Needs a diploma and has a strong interest in video games. Weekend hours. 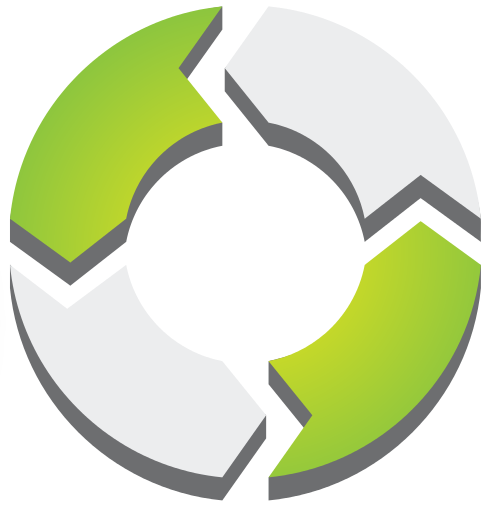 Test pre-release games, verify functionality, data content, performance, compliance, usability/ playability, and compatibility. More surprising flexible jobs can be found at FlexJobs’ 100 of the Most Surprising Flexible Jobs report.